On 13 May 1253, the Archbishop of Canterbury and thirteen of his suffragan bishops pronounced a sentence of excommunication in the great hall at Westminster, against anyone who violated ecclesiastical liberties or the liberties contained in Magna Carta and the Charter of the Forest. 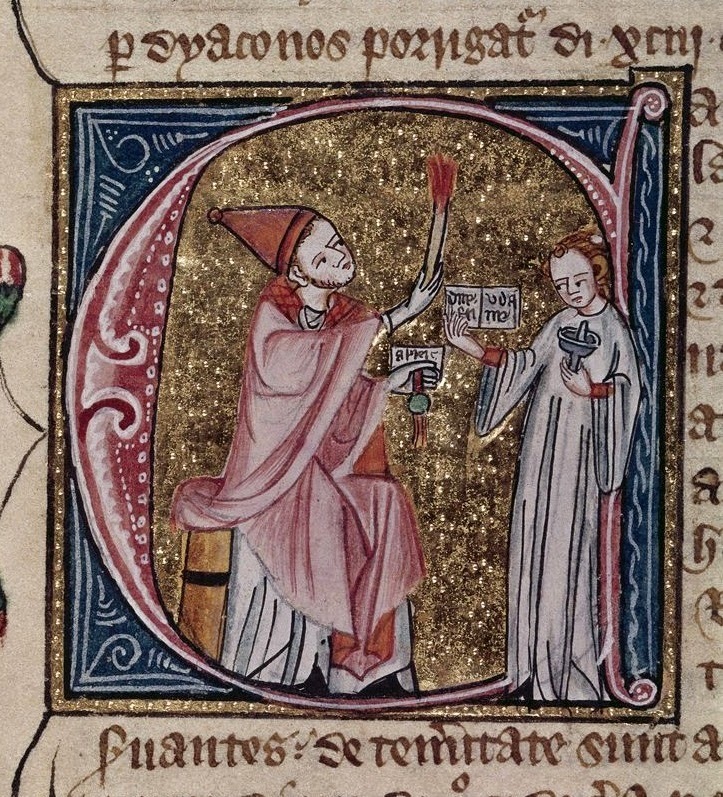 Although sentences of excommunication had been pronounced against violators of the charters previously, notably in 1225 and 1237, this is the first for which a text survives. The bishops invoked the Trinity, the Virgin Mary, Saints Peter and Paul, and all saints and martyrs, as well as the champion of the English Church St Thomas Becket, and the canonised Anglo-Saxon king, Edward the Confessor. They then proceeded to ‘excommunicate, anathematize, and sequester from the threshold of the holy mother Church’ all those who deprived churches of their rights, or who violated, infringed, or diminished the free customs and liberties of the realm, especially those contained in the Charters. Anyone who disturbed the peace of the kingdom was also excommunicated. The ceremony performed by the bishops was described by the monastic chronicler Matthew Paris, who wrote that as the sentence was finished and the candles held were thrown down (so that they were extinguished and smoking), everyone said, ‘Thus are extinguished and stink in hell those who attack this sentence’, and bells were rung. The king himself declared, ‘so help me God, I will faithfully guard all these terms inviolate, as I am a man, as I am a Christian, as I am a knight, and as I am crowned and anointed king’. Paris noted that before the sentence had begun the king had been offered a candle to hold himself, but had declined on the grounds that this was improper because he was not a priest. Instead he held his hand to his chest for the entirety of the sentence, with a cheerful expression on his face. The background to this solemn pronouncement was that the bishops had called for the king to renew and confirm the Charters, and in return they would agree to grant him a large tax. David Carpenter has discussed the negotiations surrounding this confirmation in detail, but key to understanding these events is that it was the bishops, rather than the secular nobles, who pushed for the confirmation. This was largely because the clerical tax requested was considerably more substantial than the tax imposed on the laity. It is therefore significant that the sentence of excommunication protected the Charters, but not only the Charters. It in fact begins by protecting the liberties of churches, and in a separate clause the liberties contained in the Charters. The bishops thus tightly bound the freedom of the Church to the freedoms in Magna Carta. The sentence was later pronounced in the localities, in every parish church of the country. In the dioceses of Lincoln and London, however, it was also pronounced in secular spaces, with priests turning up at county courts with hand-bells to fulminate the anathema. Paris noted the particular efforts to have the sentence publicised by Robert Grosseteste, the bishop of Lincoln, who died later in 1253. Paris claimed that he did this because he was afraid that the king would renege on his promises. The text was also confirmed the following year by Pope Innocent IV, and at the end of the decade by Alexander IV. Innocent appointed the dean of Lincoln, Richard Gravesend, to publish the sentence of excommunication. Gravesend ordered each bishop to ensure that it was pronounced not only in every church of the country, but also in all public assemblies. This was to be done in both English and French. From 1253, every time infringers of the charters were excommunicated, it was this 1253 text that was used. Confirmations of the Charters were frequently sought by both bishops and the secular nobility for the remainder of Henry III’s reign, and again during the reign of Edward I. Particularly important confirmations of the Charters, with renewals of the excommunication, occurred during the conflicts between the king and the barons in the middle of the century, during the period of reform and rebellion, and at the end of the century when the Charters were reissued as the Confirmatio Cartarum. Public Magna Carta excommunications pronounced later in the century and in the fourteenth century were again followed by orders that the sentence of excommunication and the Charters themselves should be published in local parishes in the vernacular. This important tradition of publishing Magna Carta in the vernacular in local churches, with a solemn ceremony of excommunication, started in 1253. This blog is contributed by Felicity Hill (UEA), whose doctoral research looks at excommunication and politics.